As usual every Christmas season TabletPC2 publishes the Santa's Gift List. The Surface RT was included this year, something that does not surprise me even now when resent rumors are talking about MS cutting down the orders quantity for the rest of the year. Some days ago I found an user threatening Microsoft to return his Surface if Microsoft does released a Facebook Apps. I had and still have now when I'm writing this note to put in practice all my experience as Tech Support to do not explode and name that person the best I can in my "French" vocabulary. 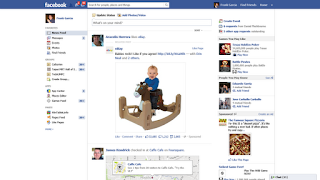 Instead that I asked a question, what's wrong with Facebook.com? For the first time you have in a Tablet a full version of Facebook working and this user is making a big deal because "he can't access Facebook"? That person never replied back to me. I wonder why. And Facebook is not the only request. Twitter! Where is Twitter client?! I changed my Twitter background image a long time ago after that I bought an iPad and I never saw that beautiful background again. One more time why I would need an App if I have access to the real thing!? This article summarizes my thoughts about the Surface RT. 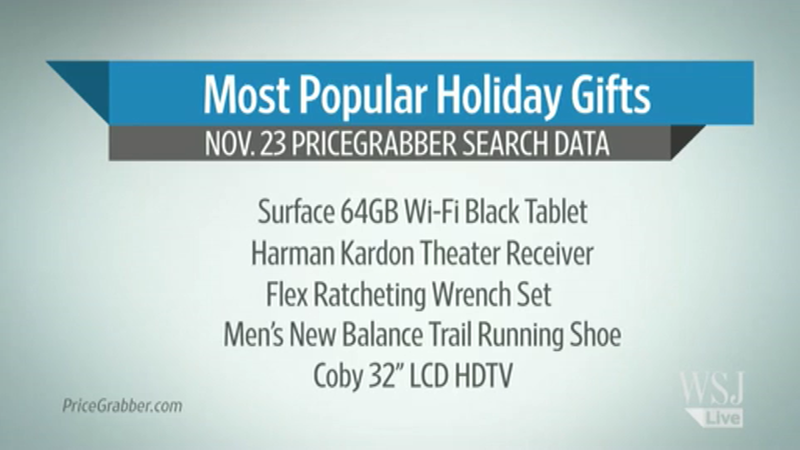 It may not be perfect or bit the iPad on the black Friday sales but sooner or later it will gain the attention of business users and that will shift the market. Paul Everton is the CEO of Yapmo, a Company specialized in Software for businesses. He recently bought a Surface and his conclusion was that there is not any Tablet in the market better than Surface to cover the business users needs. 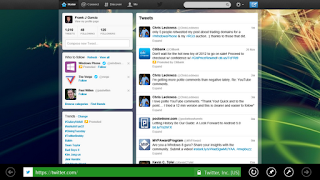 Initially, I thought that the lack of apps was where the Surface would really struggle. My assumption here was only half true. 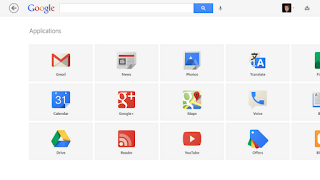 When you have a tablet that has a full web browser that can load anything, the need for apps greatly diminishes. 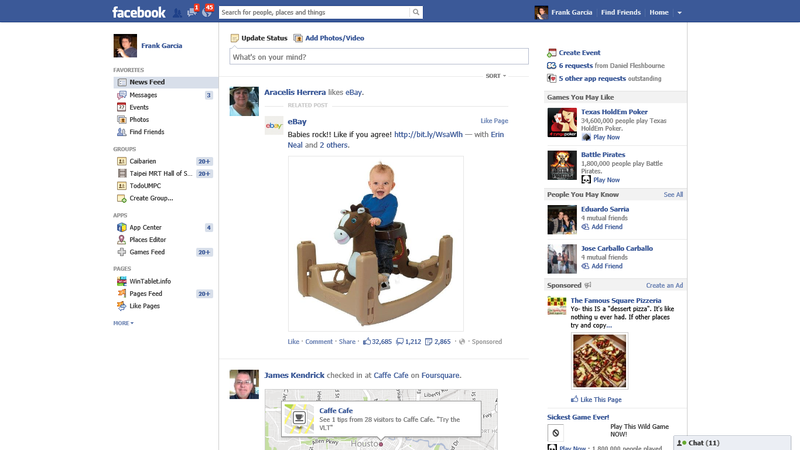 Instead I just went to my favorite "Apps" on the web and pinned them to my start page. Now I get the full experience of everything, and not some slimmed down version to make it an app. A real file system. This might be one of the most important features. iPad's inability to share files between apps is frustrating and ridiculous. With Surface if someone sends me a word document and I want to download it to a folder and access it with 10 other programs I can do it with ease! This is another place the Surface wins hands down! A real browsing experience. I have become numb to mobile device browsers failing on all sorts of websites. 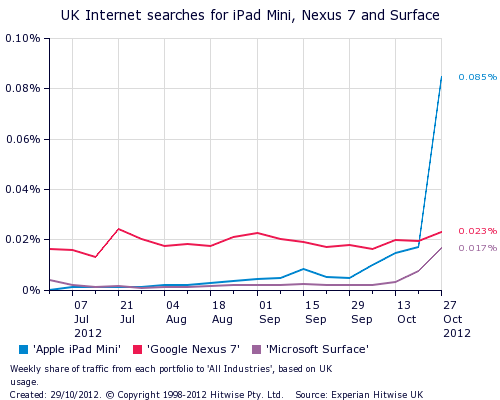 So I was pleasantly surprised to discover that Surface will load every web page, no matter what (content?) it's running. A good example of this was sitting on my couch the other day watching TV. I wanted to order a pizza from Dominos (yes, I know I live in Chicago and this is a sin to like Dominos over other pizza restaurants). In the past, this site never worked on any mobile or tablet browser I have used. While I waited for my pizza I opened up Amazon EC2 and also checked the status of our server infrastructure. Finally, something that doesn't show me half the page or fails to load key functionality. 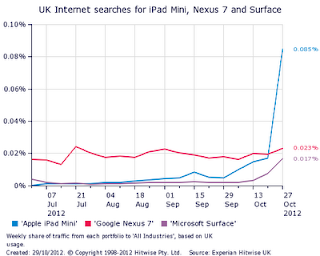 According to Experian the most searched devices in the UK market are: iPad Mini, Nexus 7 and Surface RT in this order. 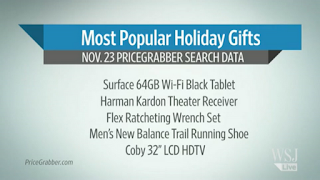 Surface RT is in the top of the wish list for this Christmas according to PriceGrabber. According to various sources, Microsoft will support the Surface RT until April 2017. Really good news for Surface's Owners showing Microsoft commitment to this device. As many other sites already noticed, Apple stopped updating the original iPad after 2 years and one month. Can Microsoft keep such promise? Well, 4 years is a long time when you are talking about technology. Microsoft ended with Windows XP the idea of supporting without upgrades the same OS for long period of time. Now we should be seeing a new OS every two years. 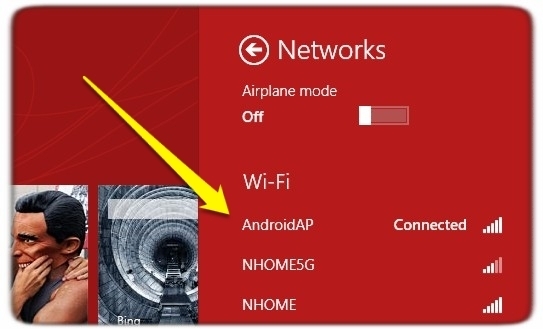 So if this still in place we should see at least one more version of the OS in the life of the Surface RT. Will IT be compatible with a new version of the OS or the hardware is not going to be powerful enough to handle that OS new version? Let's hope it's. By now I doubt that anyone out there believe that the Surface is not a well made Tablet. But if you believe otherwise I invite you to check this video. 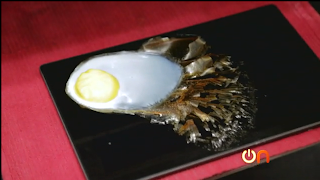 In this video the Surface survived more than 2 hours in a freezer. Then it was used to cook an egg for more than one hour at 250 F.
And again, it survived this test. Unfortunately it got finally killed by a glass of wine on top﻿ of it. Even after it's dead the tortures did not end, it was used as skateboard and thrown few times against the cement floor. The glass broke when it felt into it's corner. A test that almost nobody passes. No doubts about it, the Surface is a well made Tablet. Community leaders share their expertise at Microsoft Stores! Microsoft Stores are not only a great place to get the latest and greatest PCs, tablets, games and phones – they are also a place to learn about using technology in the real world! 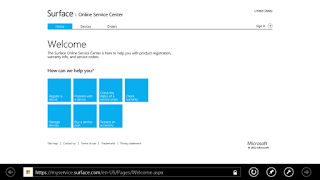 You can find workshops and other events at the Microsoft Store’s event calendar nearest you! This holiday season, technical experts from the community as a part of Microsoft’s Most Valuable Professional award are joining in to host consumer education sessions! Attend & Complete a Survey to Enter to Win a ASUS VivoTab RT! Across Microsoft Stores in the United States, Canada and Puerto Rico, “MVPs” are joining the Microsoft Stores at consumer workshops to share their expertise and insight about using Microsoft products in real life. Topics for these sessions include: Meet Windows 8, the new Xbox Experience, Outlook.com, Office and more! By attending one of these sessions and completing the attendee survey, you are entered to a sweepstakes to win one of two ASUS VivoTab RTs with Windows RT and Office Home and Student Preview RT! You can find the official rules here. 1. Attend one of the free MVP Consumer Camp workshops at a Microsoft Store. 2. Complete and submit the attendee survey. All of these events are presented by Outlook.com in partnership with Microsoft MVP Award and Consumer Camp. If you have questions about this, email mstips@microsoft.com. You can find the official sweepstakes rules for session attendees here. Share you tips and win in the Microsoft Community Video Tips sweepstakes! Everyone knows - video is BIG! The community has been using video online to share stories about your life, highlight things you care about and educate the world about technology! Today, Microsoft is celebrating all the ways people just like you share your ‘tech tips’ through video by launching the Microsoft Community Video Tips sweepstakes! There are so many exciting new products from Microsoft this holiday season – Windows 8, Windows Phone 8, Office Home and Student RT preview, your favorite apps and more! Take your pick! Enter to Win a ASUS VivoTab RT! On December, 18th 2012, two random submissions will be selected to win an ASUS VivoTab RT with Windows RT and Office Home and Student RT Preview! Want to improve your odds? Add more video tips for more chances to win! Better still - There will be two additional ASUS VivoTab RTs going to random winner, exclusively for video tips that highlight the features and value of OUTLOOK.COM! There are plenty of great features you could highlight! 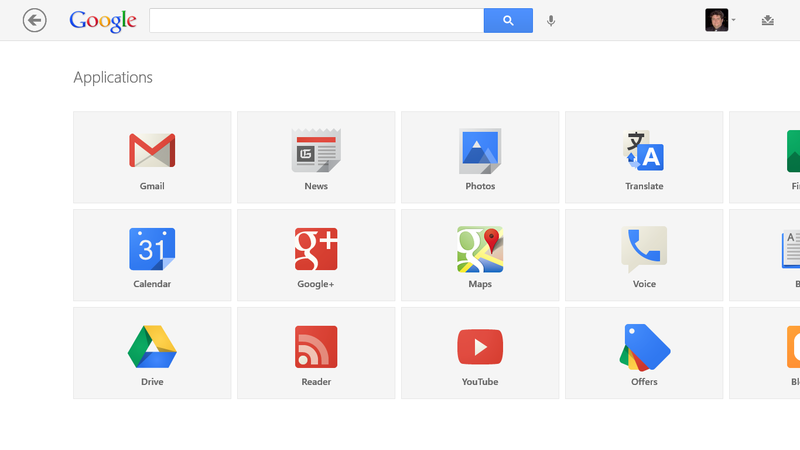 Share how you use the sweep feature to keep a clean inbox! Highlight how you’ve connected all your email accounts into one Outlook.com account! 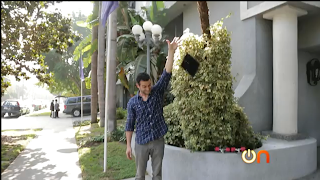 Any real world tip you can think of, share it and enter to win! 2. Submit your video tip links in the submission form. 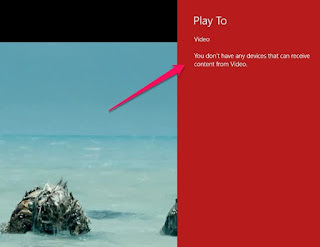 These video tips are presented by Outlook.com in partnership with Microsoft MVP Award. If you have questions about this sweepstakes, email mstips@microsoft.com. You can find the official sweepstakes rules here. That's it. The first player that plays almost all formats has been released in Microsoft Store: XYPlayer. That's the good news. 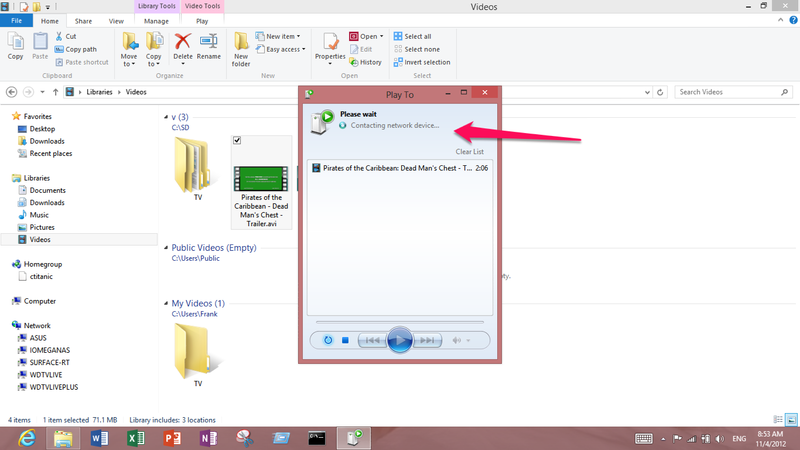 The bad news is that it does not work, it does not play any of the video files I tested it with. I'm familiar with the iPad version and I think that this issue will be fixed soon so keep your eyes opened for an update. Believe it or not still out there a lot of people asking for an Ethernet connection for the Surface RT. The reasons are many but ones of the most important are speed and security. 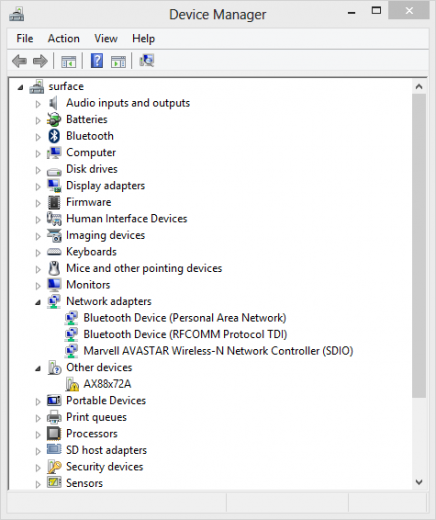 For those in this situation here is an adapter that has been tested with Surface RT which drivers for WinRT has been released. Here is the link to the Adaptor at Amazon. Here is the link for the Driver. Of course you need to download the one for Windows RT. 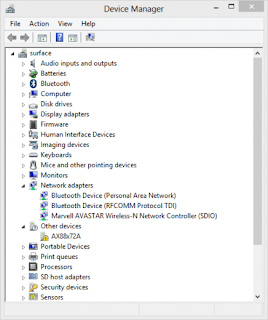 This driver will work with any USB to Ethernet adaptor using the AX88772A chipset. 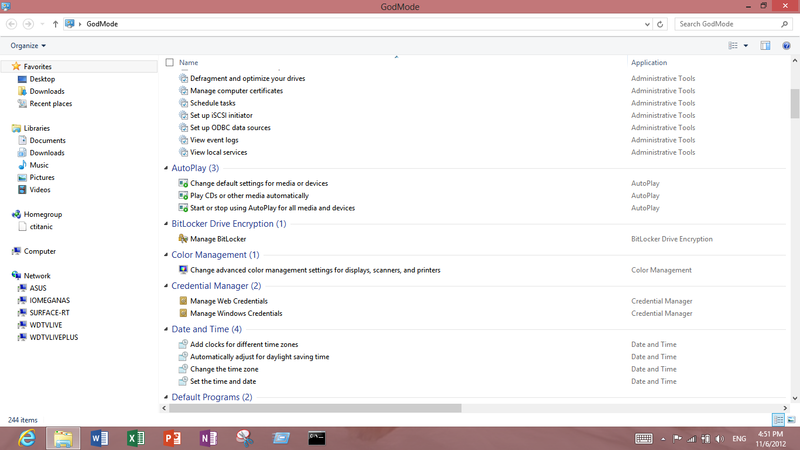 Once the device is plugged you need to open the device manager, in Desktop mode search in settings for Device Manager. 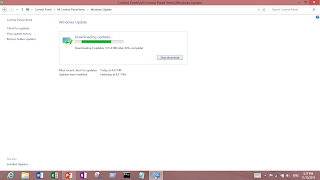 Do a right click in the listed other device chipset and pick update driver. 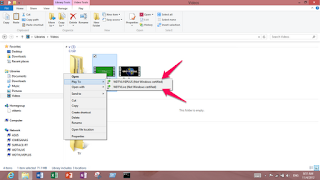 The rest is to pick Browse my PC and locate the uncompressed files downloaded from the above mentioned link. Note: for some reason the RT driver has been removed from the list of drivers in the Manufacturer's site. I have contacted them asking about the reasons behind that. If I get any answer back I'll post it here. 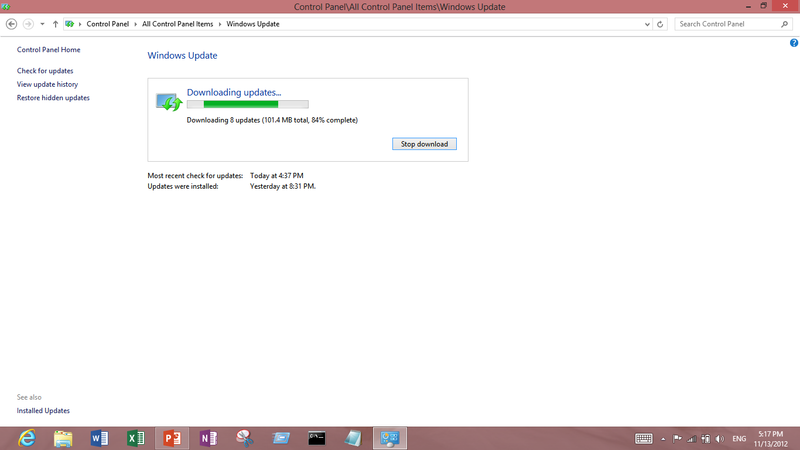 Update: the driver exist and works and the only reason is not distributed is Microsoft's nonsense. Browsing YouTube I found a video that compares the boot time between the Surface and the iPad 3. I never have problems with WiFi in the Surface, now, my 5Ghz band is weaker than the 2.4Ghz which is also normal but I find that it's a little bit weaker than what I think it should be considering the distance between the device and the AP. Using a DOS windows with elevated privileges you can apply almost all the recommended settings there. Taking in consideration that I did this with my Surface almost right out of the box and that I have only seen the "limited" message issue one time connecting to my phone using it as hotspot in an area with a very poor 3G reception, I'm inclined to think that may be that some of the settings mentioned in the above link may help with some of the issues described here by other users. I have been checking the WinRT Apps Store for the last 5 days and with the numbers collected I prepared some statistics. 5 days is not enough data for a serious study but will give a fair idea of what is the growth in the Application Front. The average of applications released in 5 days was 291. 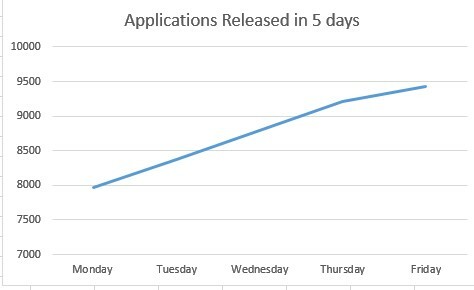 This means that in 24 working days we should be seen a total of 6989 applications released. We should be ending this year with 13395 applications and the year 2013 with about 89107 applications. These numbers are not bad at all but keep in mind that it's better to have 100 applications with good quality than 100000 "farting" applications. In this field since the Surface Release I have seen released good Applications such as eWallet, Bank of America, Nook, Zillow, The Weather Channel, Weather Bug, Urbanspoon, Kayak, Flixter, Angry Birds and many other from well known companies that are popular in Apple's Store and Android. In my opinion, by the end of year I should see installed in my Surface all my preferred application I was using in my iPad. 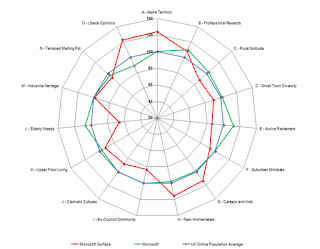 By the way, the chart shown in this article was created using Excel 2013 RT without using any keyboard or mouse, just the touch screen. It's simple, but I just spent less than 2 minutes typing the data and creating the chart. I found the experience very pleasant and for those saying that Office RT is far from being a productive tool when it used in a Surface RT, you are all absolutely wrong. After this experience I'm more than convinced that Surface RT is the perfect tool for those that want to own a Tablet and still being productive. For those looking just for a consumption device you have the iPad. Google Search has been released in WinRT Store. I have played a little with this application and I'm really not impressed at all. 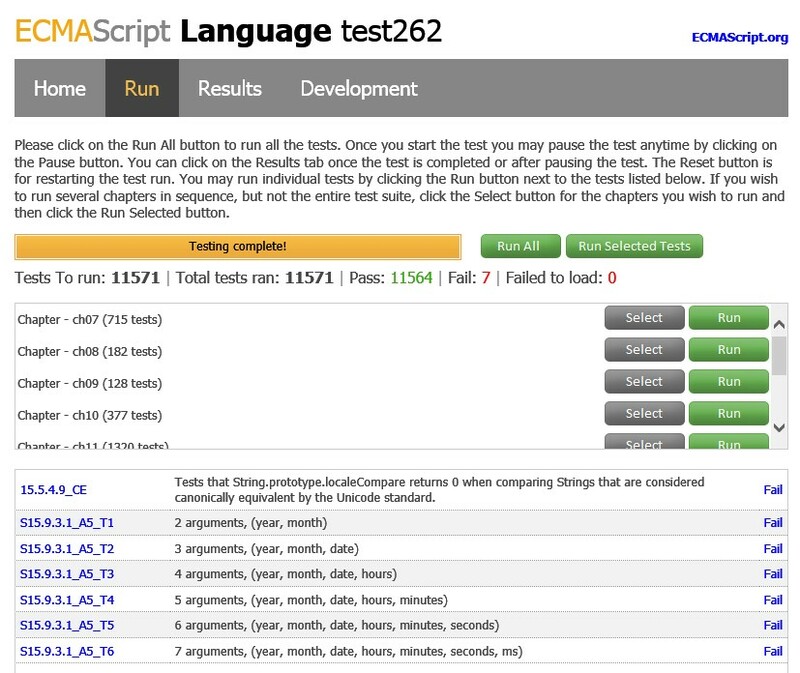 The application was not optimized for WinRT from the performance point of view. Maps shows you the Desktop page which is too heavy for the ARM processor. Blogger does not work properly. Voice Search failed to recognize my broken English 70% of the time. 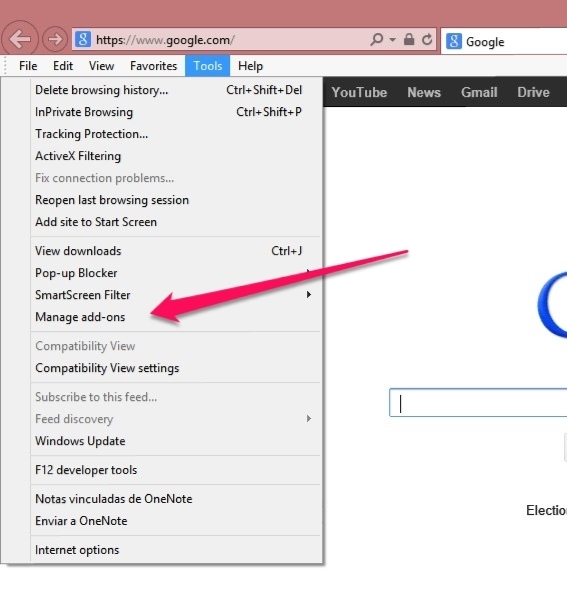 YouTube asks you to install flash player even when it runs properly if you open it from IE. The Search tool works but it does it well when you run it from IE so I do not know at this point if it's a good idea to waste your HDD space in this half cooked application. The guys at Tom's Hardware have played a lot with their Surface RT and here is what they said about it. With the few things we dislike aside, we continue to be bullish about using Microsoft's Surface as a replacement for the Ultrabooks and MacBook Airs we carry around with us to trade shows and meetings, along with the tablets we use around the house when we get home. 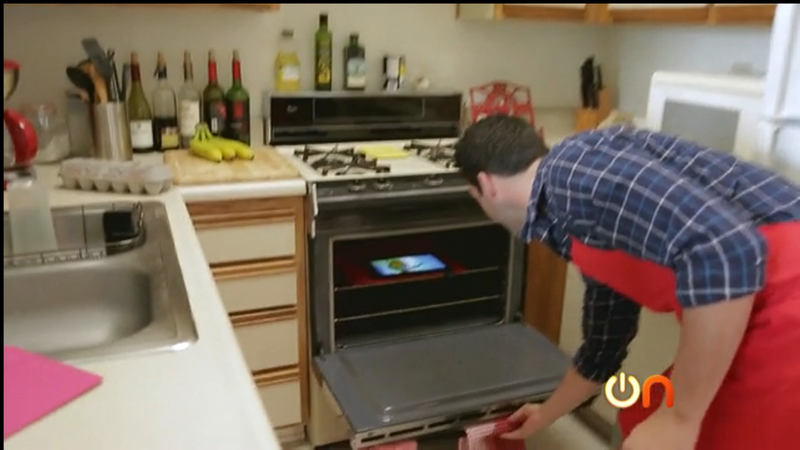 Flip the cover up and drag our fingers around the way we'd use a tablet? Sure. Drop the Type Cover down, snap out the kickstand, and bang out some email? Definitely. Hook up a second monitor for some extra workspace in the office? Yes, please! We certainly can't say the same for any iOS- or Android-based device. One of the Surface's biggest advantages is its ability to multitask effectively. And yet one of its most glaring weaknesses is the Windows Store, with its limited selection of Windows RT-ready apps. 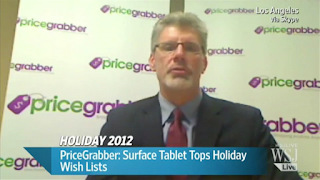 We have to hesitate on a recommendation knowing the Surface Pro is coming soon. 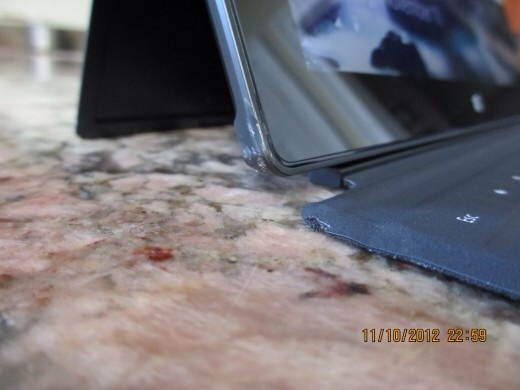 We're only afraid of what it's going to cost, given a steep price tag on a Surface with the Type Cover we like so much. They ran a lot of battery tests and Surface's Battery is not bad. 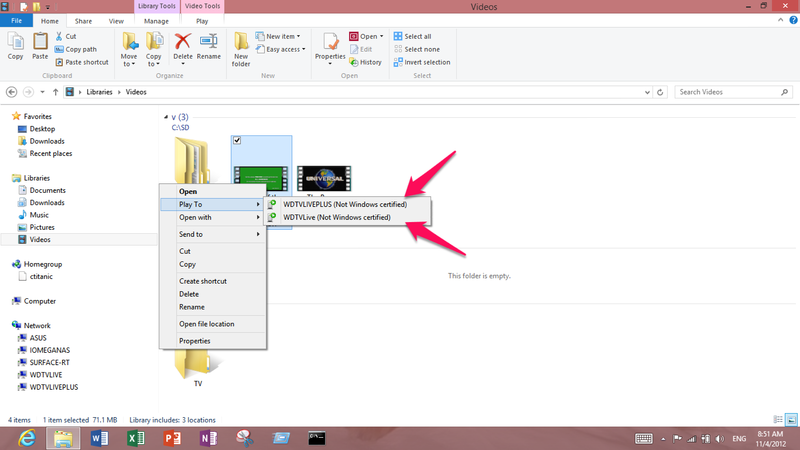 The above screen shot shows HandBrake, a tool used to create MP4 or MVK from any other video format or DVD, running in my Surface RT. Ok, I'm cheating. 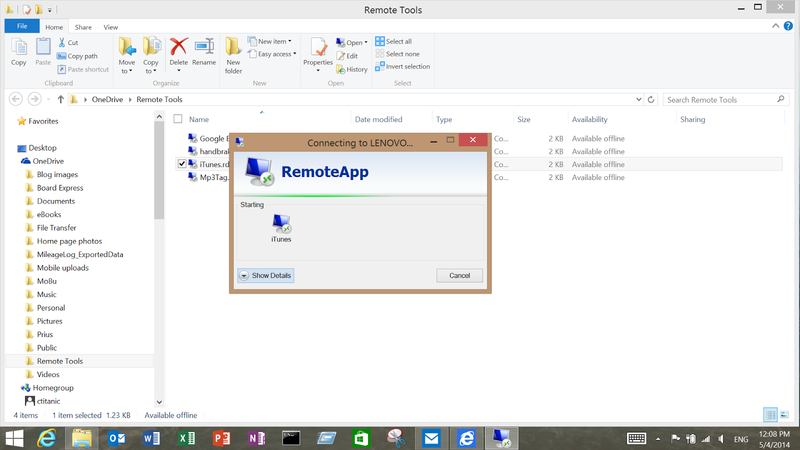 In reality I'm using a new feature introduced in Windows Server 2008 called RemoteApps or Remote Applications. This feature allows a machine with Remote Control enabled to connect to another machine, server, with Remote Control enabled and run just one specific application resident in the Server Machine. The trick is that some users found that this feature from Windows 2008 Server is hidden but present in Windows 7 if they change some registry keys. Later on somebody created this tool to make the life of the rest of us easier. The whole process is really simple. You enable Remote Desktop in your Windows 7, you install Remote Desktop in your Surface RT, search in your App Store for it, it's free. Once you have that, download and install the above mentioned tool in your W7 and run it. 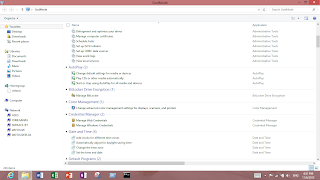 You fill all the fields needed, create the Application Settings in W7 and then hit the create the RDP file button. 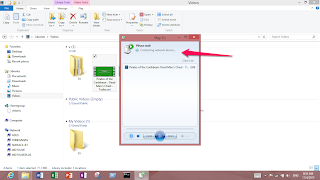 That will create a file that you are going to copy in your Desktop in Surface RT. The rest is just double clicking on it and after establishing the connection you will see the application opened in your WinRT device. People has tested this approach with other applications as complex as Visual Studio and it works perfect. The feeling is like you are running that application in your WinRT machine. Update: 2014-05-04. 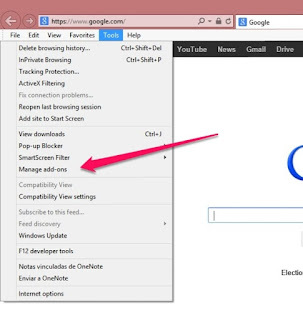 Still one of the most useful tricks to be used in Windows RT. 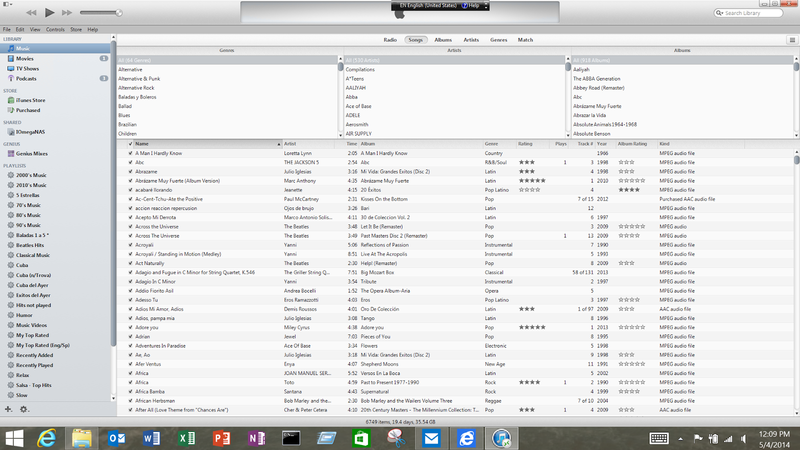 Here is a screen shot taken in a Surface 2 of iTunes. I was recently reading one of my favorite pages and I ended with a sad feeling thinking that while Apple fanatics saved the first iPad with all it's restrictions, lack of software, lack of multitasking, impossibility to sharing with other devices other than Apple's, without a decent Office package, without a full control of the file space and tied to a PC for anything or common tasks as simple as copying a eBook! While the Apple fans did that we have Windows users and News pages making big deal out of few imperfections found in Surface RT and it's OS. And the worse thing is that we all the bad press of these insignificant points we are going to kill the first steps in more than 20 years of creating a new or at least different OS and the hardware around this OS. For every single thing mentioned in those pages and articles, I can mention many features that make me a believer in W8 RT and the Surface. In more than 3 years of iPad supremacy they have not provided us consumers any of these solutions because their multitasking is far from being one. Come on, it’s time to look toward the Sun and see the beauty of it and no the black spots. Yes, they are there, we are not blind! But there are more than those black spots. Out there we do not have anything in the tablet market that can give us a decent level of productivity until know. Let’s help this new concept. Let’s open our minds. Give Microsoft a chance! A Windows RT update has been released today, the more than 105Mb package is said to fix some security holes and performance issues in this recently released Operating System. Today everybody in our technical community was talking about the sudden departure of Steven Synofsky from Microsoft in a moment when everything seems to be taking a good course for this Company. Fired? Leaving? Nobody knows for sure. I just hope that this move is for good for both sides. 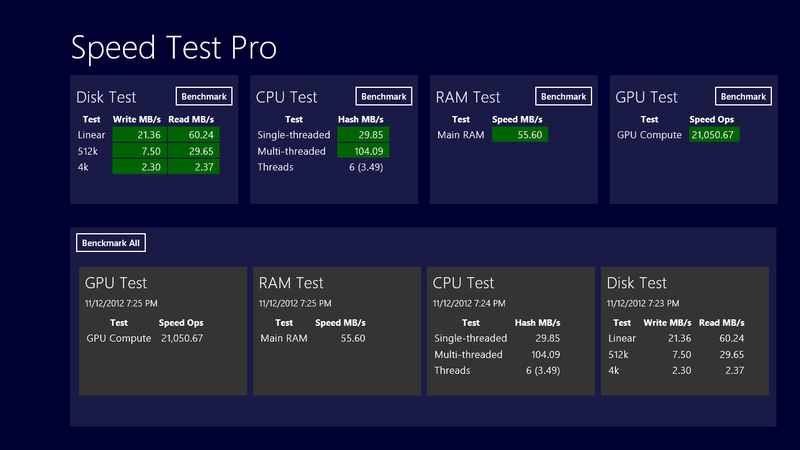 Benchmark are good because they help you to establish comparison points between PCs. 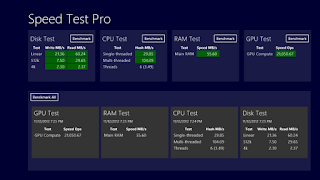 Speed Test Pro may be is not fancy or the best, but it's the first one to help in this task of comparing WinRT devices. 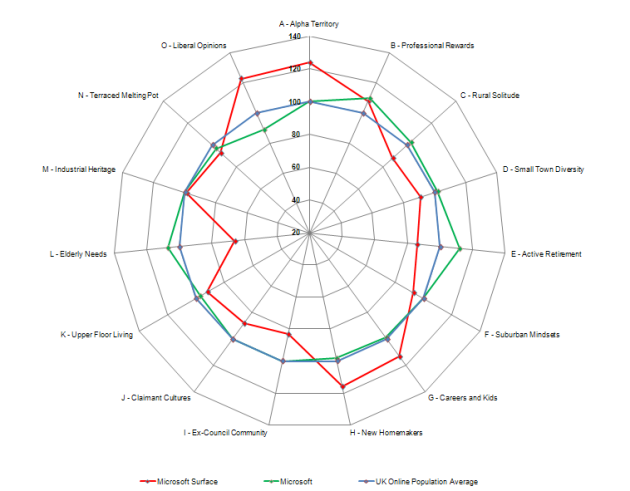 Here are the results that I got in my Surface RT. According to this source the following picture belong to a Surface RT left forgotten on top of a car and being run over later by another car. Can your iPad support that? It has been there since the release date but I just noticed. For all your Services needs of your Surface, MySurface.Service.com. 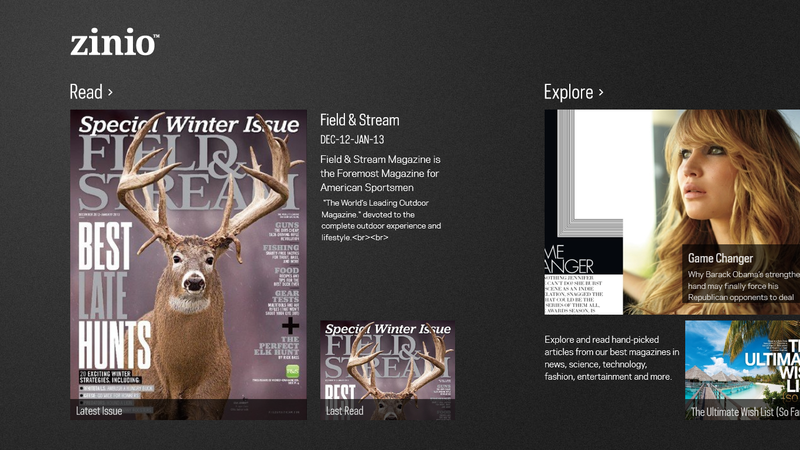 Zinio is one if not the best Magazine Reader available. 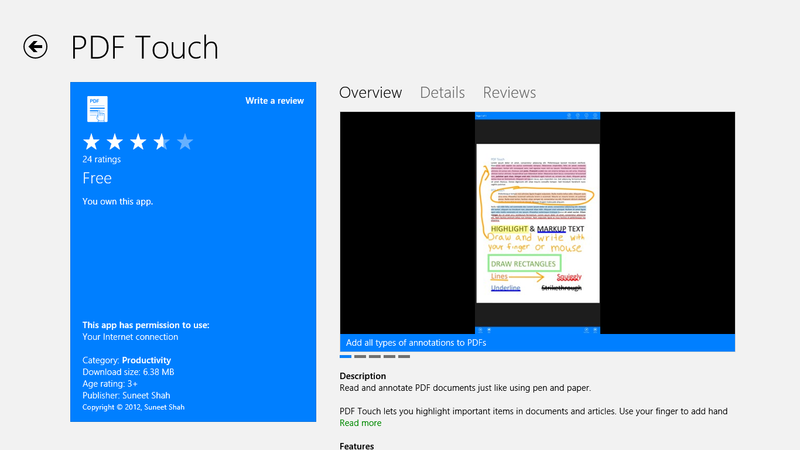 And it was recently released in WinRT Store! 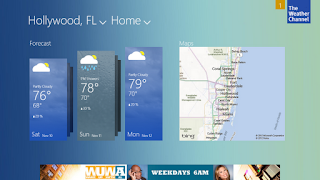 The Weather Channel Apps is one of my "Must Have" Applications. It's was just released today. 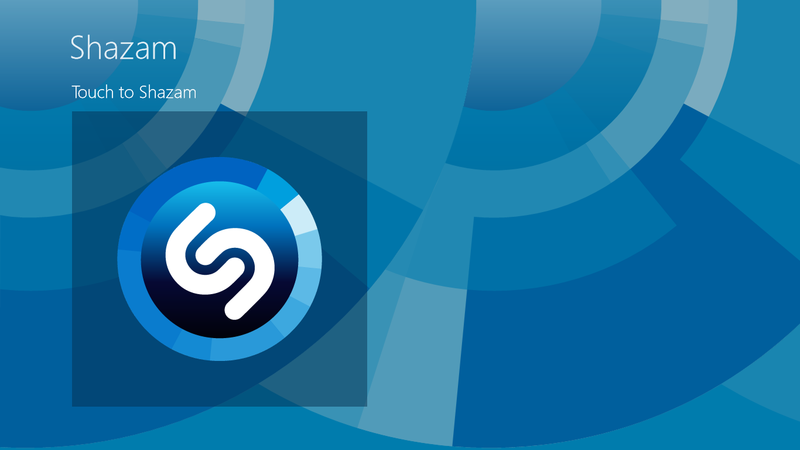 Shazam is one of the tools that I had it in my iPad, I have it in my Android phone and now I have it in my Surface. For those who do not know this tool, it's a software capable of recognizing any music playing and tell you all the information available about the song including videos available at YouTube and what's more important, where to buy it. The WinRT version has some very nice animations and design. Printing from any Tablet is almost a pain in ... You know where. No anymore if you have a Surface RT. You can print even in one of those old matrix printer! Can you iPad do this? 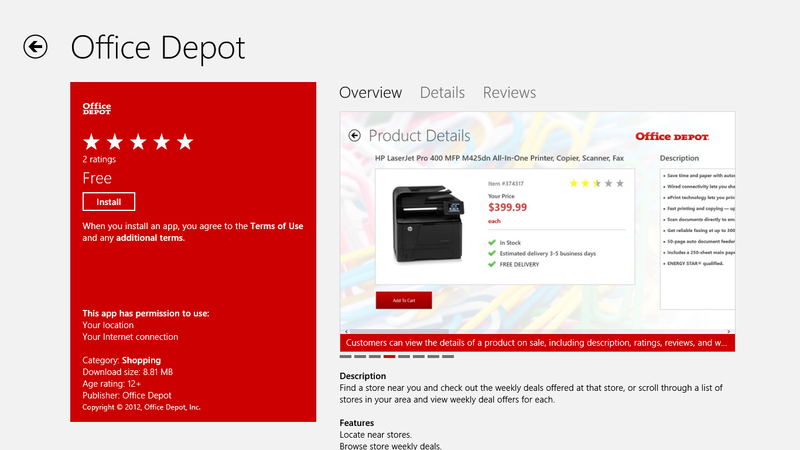 Office Depot released today an Application in Microsoft Store compatible for WinRT. Another one joining MS Store's Club! Surface RT only have 16 Gb free out of 32 and what?! There is a lot of comments and articles around the web talking about an explanation from MS of why the Surface RT has only 16Gb free. That was not news a week ago when it was released and many reported that fact. Why is so important now? The fact is that you pay the same for even less free space in the iPad 16Gb. And yes, the whole iOS uses a lot let space than WinRT, what nobody is mentioning is that WinRT supports out of the box a lot more printers and other devices than the iPad. That in the Surface RT you have a microSD slot that allows you to add 64Gb more of storage space. That WinRT allows you to create multiple accounts and that WinRT comes with many features of the full version of Windows that allows you to do what you simply can't do in an iPad. 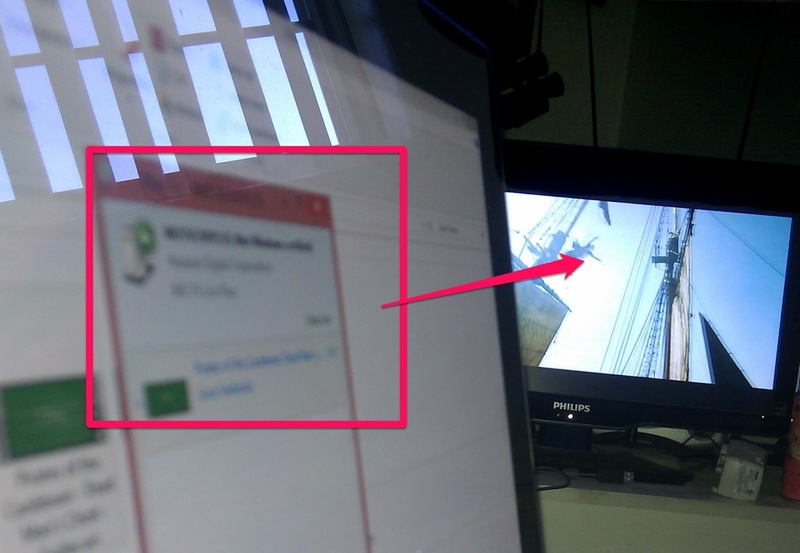 And if you doubt it here is an old trick that works very well in WinRT. The GodMode name can be changed to anything as long as you keep the extension the same. When you open the folder you will be surprised to see how many features can be configured from there and as an iPad owner I can tell you, Apple does not give you access to the iOS like MS does and that the iOS does not even half of the features that MS included in WinRT. Recently I was reading a review at pocketnow.com where the author was complaining about the bad performance of IE10 in his Surface, experience that I was not experiencing. I decided to post a comment in his review and then I noticed myself the bad performance that he was mentioning. At that moment I thought that it was something relative to a bad web design or something like that. Later on I visited XDA Developers where again I noticed the same thing. 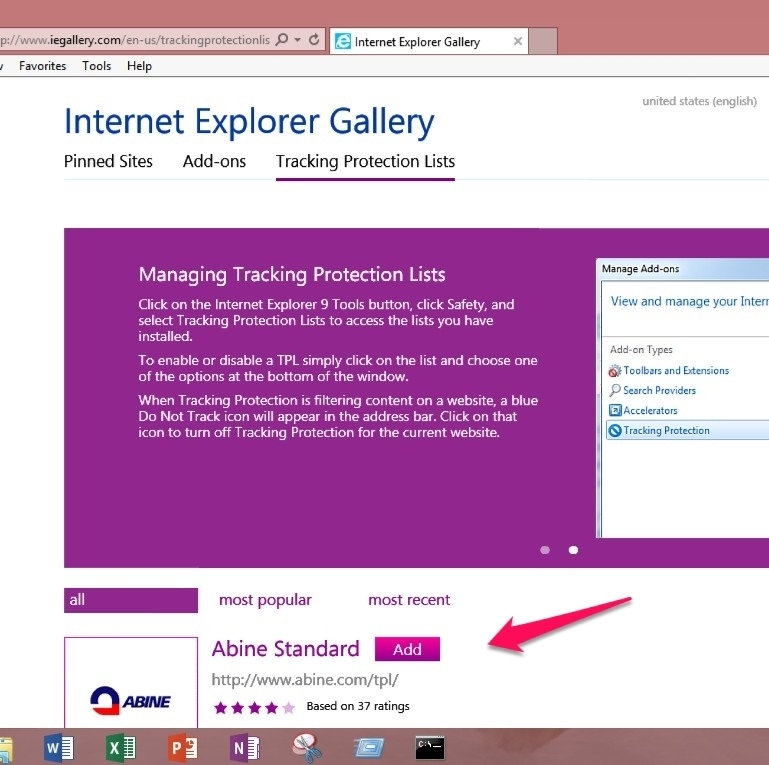 I usually don't visit these sites and that explained why I never had any issues with IE10 with Metro Style. 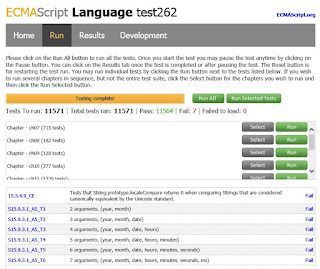 At XDA I also noticed that if I opened the site in the Desktop Mode I did not have any problems. I commented about this in the XDA forum and they recommended to block the advertising using a feature in IE10 that I did not know about it. 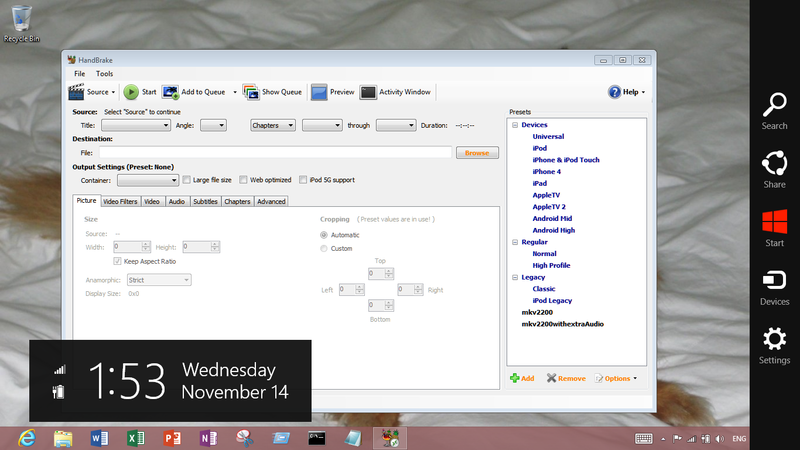 One IE10 in the Desktop Mode, go to Tools, Manage Add-ons. 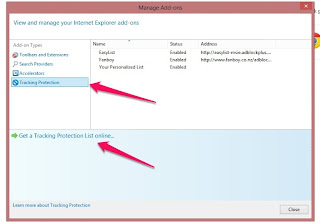 Once there click on Track Protection and then in Get Track Protection List Online. 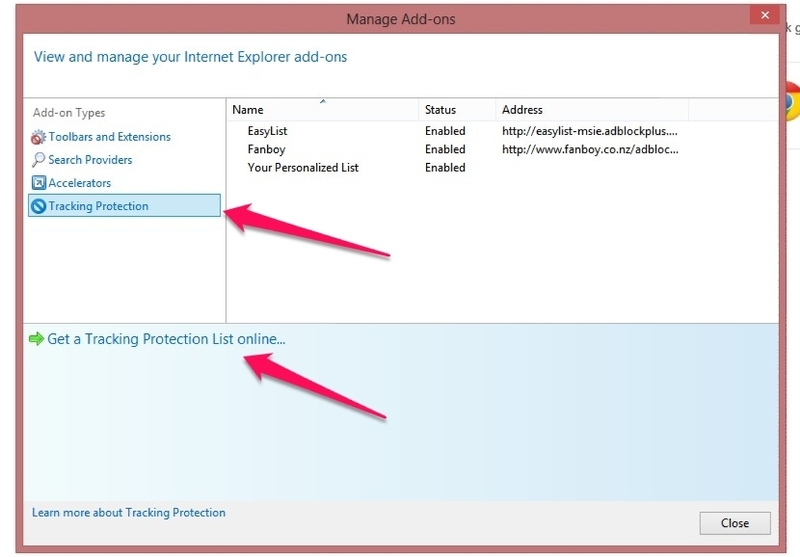 That will open a site where you will click on Add to add your favorite lists. I selected two of them, Easylist and Fanboy. Once this is done you will noticed right after that a huge improve when you open those sites and blank spaces where they had before publicity banners. 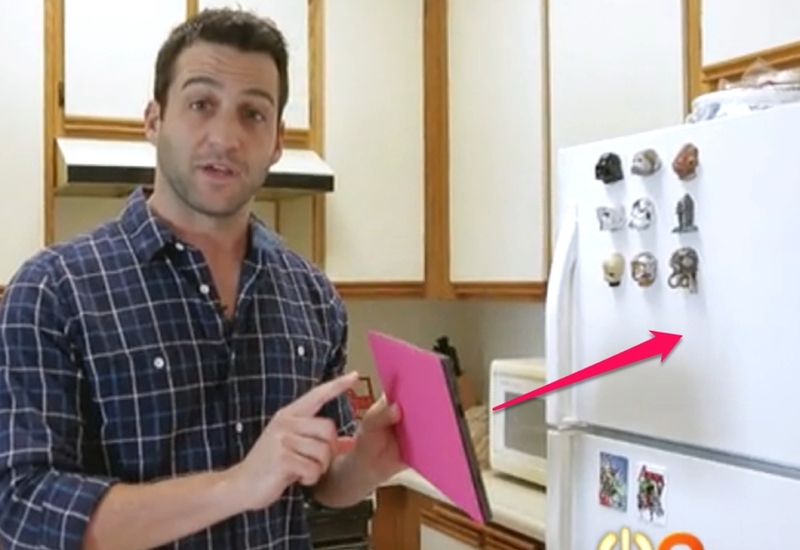 Microsoft has released an extension to one of the best publicity videos released this year. Sometime ago I was talking with an Apple fan and he was mentioning with a lot of proud that he loved the fact that he could play video from his iPad to his TV thanks to the Apple TV device he had connected to his TV. Now is my turn to say, the Surface RT can do that and even more and here is how is done. 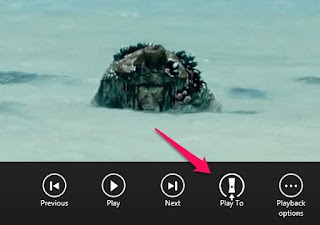 Whenever you play a video in the Video Application of your Surface you will notice a button that allow you to play the video in other devices. This button appears in the iPad whenever it detects an Airplay device or server. In Surface that button is there even when there is not any device where you could play the video. The video is playing in my TV, something that the iPad will never do using a device that was not made by Apple or without having applied, installed or hacked a workaround. That's the beauty of Microsoft ecosystem. The total cost of everything needed for this trick is a lot less than what the Apple fan boy pays for his iPad and Airplay device, and that does not count that either WD device mentioned here plays more movies formats and have a lot more features than the AirPlay. Currently we have around 290 devices in the market to select from to use this feature included in Windows RT. I was reading a review where one of the negative points found in the Surface was the lack of 3G connection. Another bill? The fact is that studies indicate that only 30% of the iPad sold are the 3G version and my personal fact is that if I carry a 3G phone makes more sense to used it as a portable AP than adding another bill into my already full of holes pockets. 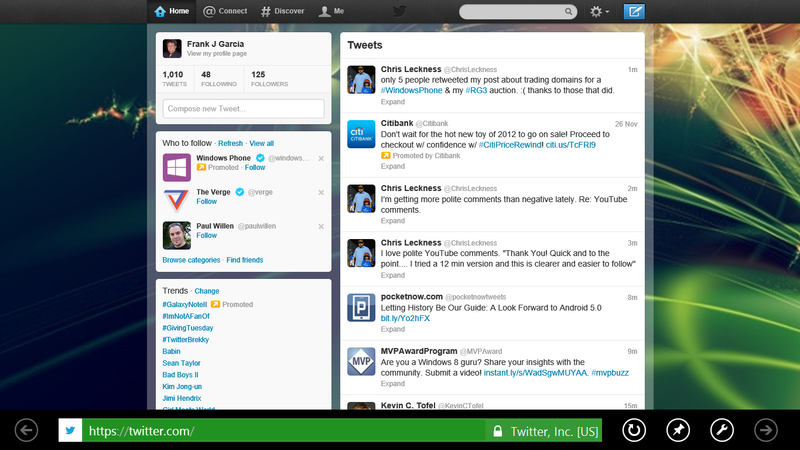 So here is a screenshot showing my Surface connected to my trusted Nexus One. BTW, this post has been entirely created in my Surface RT, including the graphic edition using applications that became available after the release date, virtually few hours ago. Consumers Report reviewed Surface RT and gave it a thumb up. I already mentioned one way to prepare de MicroSD card to be used in the Surface RT, but there is another way that in my opinion works a lot better. Using junction points like it's explained in this article. I'm using this method and I'm very pleased with the results.